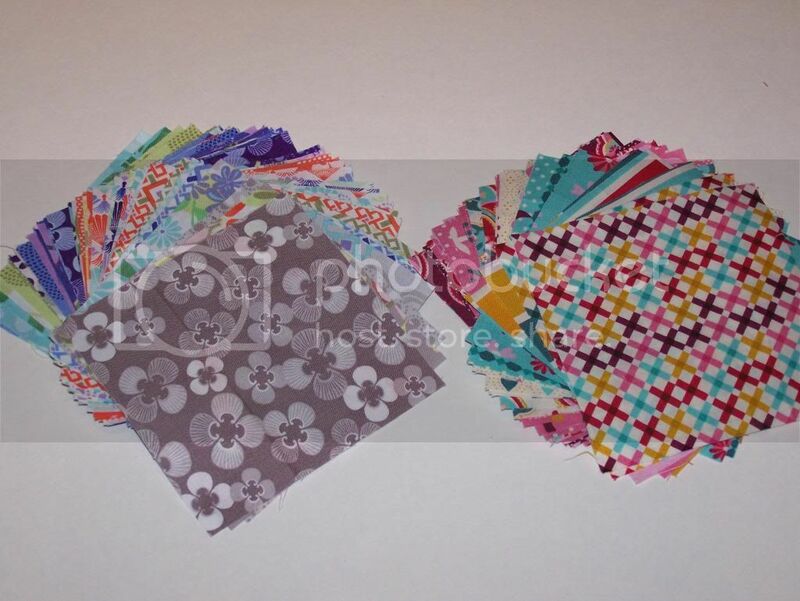 Busy Hands Quilts: Blog Hop Party Giveaway - Two Charm Packs - Good Fortune and Domestic Bliss! Blog Hop Party Giveaway - Two Charm Packs - Good Fortune and Domestic Bliss! Welcome to the Blog Hop Party! Go HERE to see around 150 participating blogs! Meet new friends along the way! Today's giveaway here at Busy Hands Quilts is two charm packs, one Good Fortune by Kate Spain and one Domestic Bliss by Liz Scott. These have been cut by me and include one 5x5 square of each fabric in the line. That is 36 fabrics for Good Fortune and 27 fabrics for Domestic Bliss. Short and sweet here! To enter this Giveaway, leave a comment telling me anything you want to share. One entry per person, please. ♥ Join in the fun and become a follower of Busy Hands Quilts by Feedburner. Then you won't miss any of the quilty goodness here! ♥ Why not take a peek at my Etsy shop, Busy Hands Quilts. You really don't have to make everything yourself, you know!! ♥ Maybe your blog needs a new cute graphic?! Grab My Button for your blog! It's new, it's cute! Don't forget to join the fun at other Quilting blogs along the way! This giveaway ends on December 15th at 5:00 p.m. Winner will be chose at random and posted by Monday, December 17th. Thanks for the giveaway. I'm already a follower. Already a follower here too - thanks for the giveaway! Your blog button is really cute - I am a follower too. I love both these fabric lines - thanks for the lovely giveaway! Good morning! How nice of you to create those charm packs for your give-away. Glad to meet you on this Blog Hop~! I follow your lovely blog! Thanks for a chance to enter to win such gorgeous fabrics! Somehow I missed out on both these lines when they came out. So winning the charms would rock! Thanks for the chance to win. Oooooh, gorgeous! Thanks for the giveaway. I'm signing up to follow you on google reader! What lovely fabrics! Thanks for a great giveaway...following through Google reader! This is an especially nice giveaway - I love both of those lines. I don't buy a ton of fabric, but I actually bought one of the fabrics from Good Fortune and it is so pretty and so soft! It would be really fun to have charms of the whole line! I am a follower, Mrs. Hearts and I hope that you are able to meet new friends that soon become new followers. Thank you for joining in the Party and sharing such a wonderful giveaway with all of us. Here's hoping your holidays are the best yet to come. Great charm packs. Thanks for the chance to win! Such cute fabrics, please count me in! These are two of my favorite fabric lines - thanks for the chance to win! thanks for this giveaway! I love the colors :) Thanks for this chance to win! What a nice give-away! Thank you! Those are both such pretty bundles! Hmm... something to share. How about the new Barbara Kingsolver novel? If you haven't read it you really should. The scarves in your etsy shop are beautiful! Thanks for being the fun blog hop. Love both packs you made. My Favorites list is growing while visiting the shops on Quilting Gallery's blog hop. What a great blog. I'm a new follower and can not wait to see what you come up with. Great giveaway! I am a follower. These are beautiful! Thanks for hosting this giveaway. Thank you for a chance at some pretty fabric. Love this blog hop! Am finding new blogs to follow and be inspired:) Thanks! What a fun giveaway. I live in Washington too, in the rainy part. I am a new follower. Lovely fabric! I'm a new follower via email. Nice Etsy shop. I'm on Etsy, too (Pink Scissors Design). I am making a quilt for my new granddaughter. Okay, I finally got to it a different way. It wouldn't let me comment on the specific blog post, but when I pulled up your blog in general, I could get to comments from there. How strange! These fabrics are really pretty and I appreciate you taking the time to cut all those squares. I am a follower of your blog. Thank you for the giveaway. Love the fabric. I'm enjoying looking around your blog. Cute fabrics. I do love some charms. Thanks for the giveaway. Love these fabric lines! Thanks for the chance. Looking at all the quilts in your Etsy shop, I'd say you do have busy hands. Cute fabrics! Thanks for the chance to win! Both these lines are right up my alley. 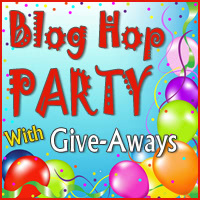 Thanks for participating in the Blog Hop Party. I love blog hops and bloggers. I have found some of the most wonderful ideas, quilts, embroidery it is absolutely terrific! Hmm...I'm a very new blogger but I'm having a lot of fun with it. I am blown away by the talented quilters I've seen! I love domestic bliss. Thanks for the chance. What pretty fabrics! Thanks for the chance to win. BTW, I love your button! I'm thinking of sneaking down to the kitchen for some late night eggnog. What a fun blog - and a great giveaway! I loved browsing your etsy shop! I am a new follower and a hopeless fabric hoarder. I try to use fabric and I end up cutting it up and making more fabric scraps. My 20 month old daughter said her 1st sentence on Friday - she said "I did it! Yay!" and applauded herself after she got out of her baby hammock by herself for the 1st time. It was even more awesome because both me & my husband were right there, talking with her when it happened - SO awesome! Your baby quilt made of domestic bliss is adorable! Your Etsy shop is very nice. I just placed a few handmade items in my shop it's worth a try. thanks for the giveaway. Oh no...I haven't seen Domestic Bliss before (somehow) and now I'll need to buy some, love that color combination! Thank you for the giveaway - something I'll share is that I've tried to learn to knit 3 times and failed each one, so I am so glad other people can do it and sell cool stuff on etsy for me! Beautiful fabrics... Thanks for a great giveaway! I just learned how to sew in October, so I don't have a very big fabric stash yet. I really like the Good Fortune collection! I'm a new follower and have enjoyed stopping by. You're doing a GREAT job! Come by and visit and follow too, when you have a minute. Right! It's December.....who has a minute? Also in Washington. Lovely giveaway. Thanks so much. I just love charms. It's an easy way to get all the prints from a line without spending a fortune. Plus those small squares are easy to carry around to match up with other fabrics. Love the fabrics you're giving away. Thank you for sharing an awesome giveaway. This is great! Thanks! i follow! I can say anything, huh? I'll admit to you that I am very concerned with the future of home quilting, as the older ladies die off and young people prefer technological hobbies.....Thanks for the chance to win! Hello from snowy Minnesota. I love the charms you are so generously giving away. Thanks for the chance to win them. Thanks so much for the lovely giveaway. Such pretty fabrics. Thanks for inviting us to your party! I love the fabric selections and am a new follower. I'm looking forward to taking a look at your projects. I love charms! They just seem to hold so much possiblity. Great giveaway. I'm nearly ready for the holidays. Love Kate Spain. Met her at Quilt Market. That was fun. Thanks. oh my, your hands have been busy! beautiful creations in your Etsy shop :) I'm following! Feeling like Rip van Winkle....just realized it is less than 2 weeks until Christmas! Yikes!! Love these charms - thanks for the giveaway. p.s. the "post a comment" link at the very bottom of your posts isn't working. Not sure if it's just me. I had to click on "# comments" just above the comments section. I love the fabrics you picked. Thanks for the giveaway! Those are gorgous patterns/prints! I plan to make a couple quilts for charity... I can really use the charms! Great giveaway! Thank you for participating. I'm a new follower thru GFC. I love your Blog..Turorials look fun..headin' back soon as I post here. Checked out your Esty store too....what cool things you make & sell! I'm a follower via email. Thank you for offering the great giveaway. Cute charms! Thanks for the chance. I sure could use those charm squares! I am a regular follower. Happy holidays! I have not seen this fabric line before. Just reading the names made me laugh and want to sew with them. Plus they are really cute fabrics. Your quilts are beautiful. Thanks for the giveaway. I love the Good Fortune line. It's so pretty! Thanks for the chance to win and Merry Christmas! Very nice charms! Charming! Nice to look around your blog. Thank you. Nice giveaway. Would love the chance to win this. Thanks! Oh those fabrics are so pretty - I am drooling.. I am a new follower -really like your blog. Thanks for such a nice giveaway. What a fun giveaway! I am a follower of course!